Riding the Solstice Canyon section of the Backbone Trail, part of the longest ride of the Fat Tire Fun(d)raiser on November 13th. Details and online registration. I sometimes walk my big dog on fire roads also used by mountain bikers. I try to pay attention as to the whereabouts of the bikers so that I can pull my dog aside, but I’m often distracted. I’ve had a number of near-misses and one bad accident. A biker came around a bend very fast, could clearly see my back and the face of my big dog. I didn’t hear him coming. 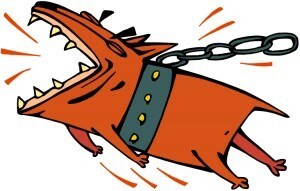 My dog lunged at him, which slammed me into the ground, and she dragged me as she tried to chase him. I screamed. Did the biker stop, turn around, show concern? No. He kept going. It seems that many bikers have no idea how to “share the road” with animals. Does COBRA provide education to bikers? 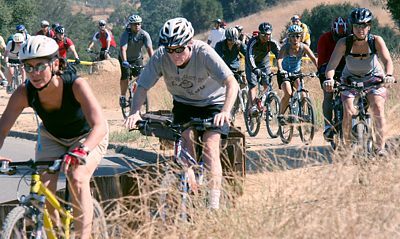 Is there a way to communicate to the mountain biking community that you shouldn’t ride toward or near a big dog, especially when the owner doesn’t see you. A dog will think its owner is being attacked and will go into defense mode. That translates into lunging at or jumping on the biker. A safe practice for the biker would be to shout “Bike!” when approaching a big dog walker who doesn’t appear to see him, and give the person a chance to pull in the dog. That keeps everyone safe. Sorry to hear about your incident. It is troubling to hear that the rider did not come to your assistance, and as a human being I am disappointed he did not show more concern. Yes, CORBA does try to educate riders about situations like the one you describe. Unfortunately, there is no way for us to control or educate everyone, nor can we install common sense and courtesy. Your experience points out that we all need to be aware of things that could potentially be dangerous out on the trails. You may have responded differently, but the bottom line is, different people react differently to different situations, and we all should treat each other with as much respect as we would expect from others. 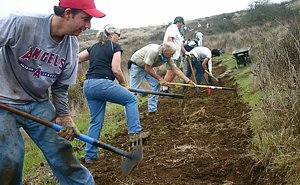 Trailwork days are being planned for November in the Angeles National Forest, but the dates have not yet been confirmed. We'll be posting the dates on our calendar as soon as they are confirmed. 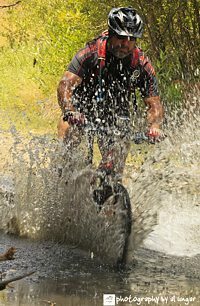 I ride mountain bike trails for free. By “free” I mean “not withstanding any of my tax dollars that may be used for park & trail maintenance.” (In the Conejo Open Spaces, most of the trail construction and maintenance is done by volunteers, the exception being large-scale removal of chaparral and weed overgrowth.) So, with all the riding I do, it really was a no-brainer to me that giving back is something I can and should do. 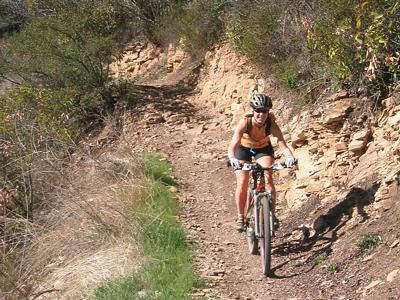 I feel such joy when I ride my mountain bike on a great trail, and wanted to experience the joy of building or repairing one so other bikers, hikers and equestrians can do the same. I had my first opportunity to do this on October 15th, and it was as rewarding as I could have hoped. 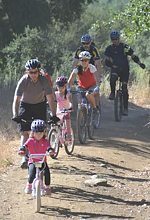 Next CORBA Kids Club ride will be Saturday November 5th at Cheeseboro Canyon. See our Rides Calendar for details.